I have a shortcut virus on my Flash drive ! Then I tried to fix it using "Attrib -h -d -r /d /s Drive:\*. *"
but it will return like a shortcut !! Then how should I remove the virus without using Attrib Command !! then how I protect my computer on contamination of shortcut virus ! As I prefer to do things without software. If it works than better or you can also try this. -- It will close the script which is running in background, responsible for creating shortcut. type this in cmd "D:" without quotes it will change directory to your memory card. then type "attrib -s -h /s /d "
It will make all files to show which are hidden. This will delete all shortcuts files. # Download UsbFix on your computer, and execute it. # It will launch automatically, and a shortcut will be created on your desktop. # Connect all your external data sources to your PC (Usb keys, external drives, etc...) Do not open them. # Choose " Deletion " option. #The computer will re-start, and it may be longer than usually. # UsbFix will display a message at re-start. 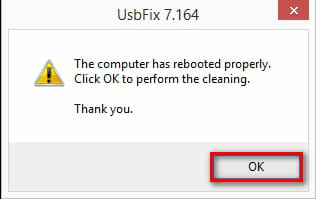 # Click "OK" to start cleaning. # Copy/paste the report here.